Honeywell's smart surveillance camera offers intelligent sound detection and motion-detection zones to assure you get only the most important alerts. Honeywell has equipped many a smart home with appliances ranging from thermostats to water leak detectors. More recently it added a pair of Wi-Fi home security cameras to its Lyric lineup: the Lyric C1 and Lyric C2. The C1 is more paired down in features and in price, but we found it to be an excellent option for those wanting maximum peace of mind with a minimum of fuss. Physically, nothing about Lyric C1 really stands out. It’s relatively small (7 x 7 x 6.2 inches), light (1 pound), and short on style—a plain white plastic camera body that attaches ball-and-socket style to a magnetic stand. The camera also doesn’t offer much articulation—it can only be tilted slightly up or down on its stand. But it has a 135-degree wide-angle lens that’s more than enough to take in all but the most cavernous rooms without much manual adjustment, whether you set the camera on a tabletop or mount it to the wall. The Lyric C1 can be mounted to a wall or set on a shelf or tabletop. The Lyric C1 streams live video 24/7 in 720p HD. It features night vision, geofencing for automatic activation/deactivation, and two-way audio so you can remotely communicate with family or pets or scare off an intruder. 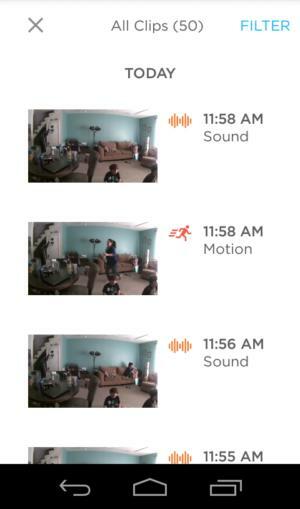 The camera works with Honeywell’s Lyric app, through which it sends alerts when it detects motion or sound. The Lyric C1 can even recognize sounds that require urgent action, such as smoke and carbon monoxide alarms, and will identify them accordingly in the alerts. 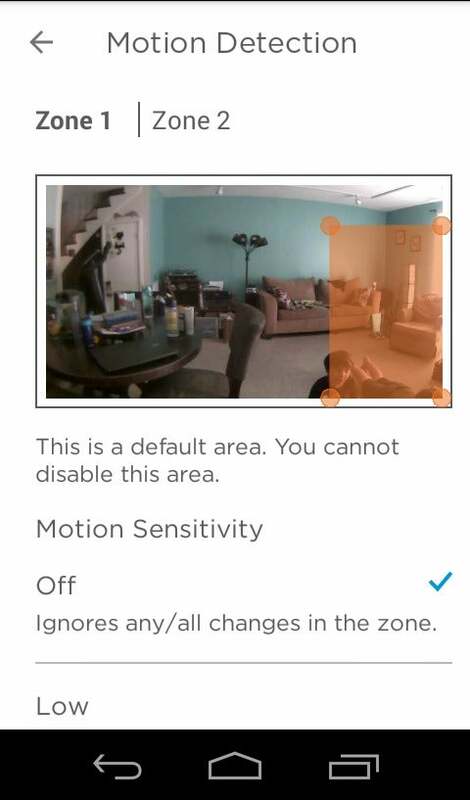 It also supports motion detection zones, so you can monitor for activity at your home’s entry points without alerts being triggered by ceiling fans, roaming pets, or other background motion. The Lyric C1 records video of detected events free to the cloud for 24 hours (7- and 30-day paid upgrades are available) and locally to an encrypted 8GB SD card (included). This is ideal as the local storage provides a backup of any forensic evidence in the event your Wi-Fi connection is interrupted. Alternately, the cloud support acts as a fail-safe if an intruder takes or breaks your camera or SD card. Video clips of detected events are displayed in a timeline in the Lyric app. Setting up the Lyric C1 is pretty straightforward. The most that’s demanded of you is connecting the power cord to the camera body—it plugs into the bottom of the camera body, adjacent to the SD card slot, so you must detach the C1 from its stand, insert the cord, and then thread it through the two prongs of the stand before reattaching the camera. Once the camera is powered up you can add it to the Lyric app. You’ll need to enable Bluetooth to connect the camera to your device; the app displays a QR code you must scan with the Lyric C1, it then prompts you through the process of connecting the camera to your wireless network. When you launch the app, you’ll see the Lyric C1’s live feed. (If you have more than one camera, they’ll be displayed in a list and you must select one to view its feed.) The 135-degree field of view was enough to take in my whole living room without needing to be repositioned. The Lyric C1’s home screen is an easily navigated dashboard of controls for the live feed. Along the top are toggles for turning sound and motion alerts and the camera itself on and off. Beneath the feed window are a push-to-talk button to activate the Lyric C1’s microphone and a button to take snapshots of the live feed. These images are saved to your mobile device's photo gallery. You can look in on your homestead at any time by tapping the live feed. Each streaming session last 90 seconds—plenty of time to make sure everything is in order. If you need more time, just tap the feed again to start a new session. The Lyric C1 delivers rich colors, but the image is a little soft, even at 720p. Night vision is excellent, with strong contrast and plenty of detail for surveillance purposes. When the camera detects sound or motion, it records a 30-second clip and pushes an alert to your device. You can access these clips directly from the alert, but they’re also displayed vertically in chronological order at the bottom of the homescreen. From here you can press on any clip to view it and hit the download button to save it to your device. Motion detection zones allow you to block out areas you don't want to monitor. Out of the box, the Lyric C1 detects motion anywhere in its field of view, so the wandering foursome of furry friends in my house was triggering alerts every few seconds. To minimize these, I enabled a motion detection zone just around back patio entrance so I’d only be alerted to movement at that entry point and all other movement would be ignored. You do this by resizing and moving a bounding box to the appropriate spot on a snapshot of the camera feed. Then you calibrate how big a movement will trigger an alert by selecting off, low, medium, or high. You can create up to two motion zones. You can also adjust the sound detection sensitivity to pick up noises anywhere from 10- to 100 decibels by setting the feature to low, normal, or high. The high sensitivity setting isn't very usesful; as the Lyric app warned, at that setting the Lyric C1 actually did detect the sound of my smartphone receiving one of the Lyric C1's sound alerts. The Lyric C1 has an easy-to-set up geofencing feature that will automatically turn your camera on when you leave home and turn it back on when you return. All you have to do is turn it on and set a radius to tell it how close your smartphone must be to the camera for it to activate and how far away to shut off. 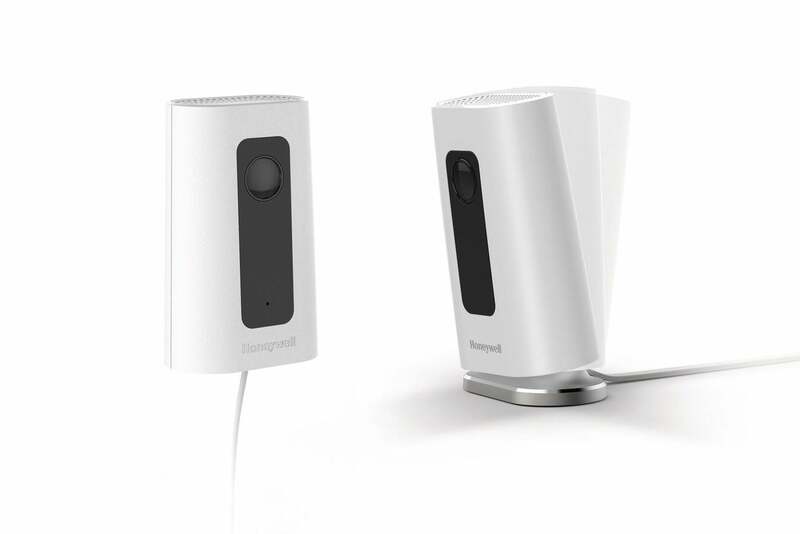 The Honeywell Lyric C1 Wi-Fi Security Camera is easy to use and every feature worked well and reliably. It may not have the bells and whistles of some higher-end home security cameras, but it has all the essentials for giving you peace of mind and requires little time investment to learn them. Don’t hesitate to pull the trigger on this one, especially if you’re a first-time security camera buyer. 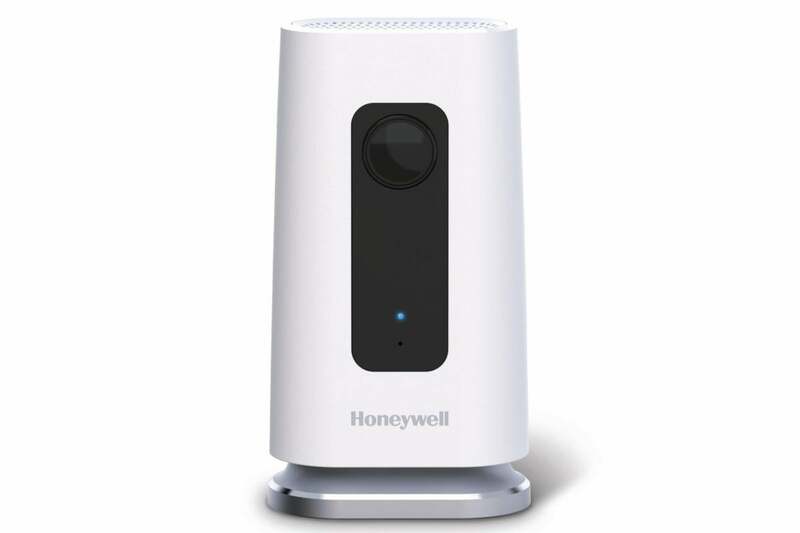 The Honeywell Lyric C1 Wi-Fi Security Camera's strong security features and intuitive apps will bring you maximum peace of mind with a minimum of fuss.